The aerostatic press and the air compressor are both main equipments in the petrochemical industry, which are used to liquefy the petroleum gas generated in the refining process and supply gas to the enterprises to support production respectively. The aerostatic press and the air compressor always need work uninterruptedly, and their motors are both designed with a larger capacity, thus, a large quantity of power is being wasted. With an aim to enhance air supply quality, cut high electricity charge and improve working environment, Ningxia Baota Petrochemical Group decided to buy three high power VFDs manufactured by Gozuk to reconstruct the three air compressors after repeated comparison and investigation. And based upon the user’s requirement, all the VFDs have the bypass function, which guarantees the air compressors can maintain running on condition that the VFDs have fault. The DCS system will control the constant pressure air supply process: Firstly, the pressure sensor of the gas container sends pressure signal to the DCS system, the DCS system will compare the received signal with the pressure setting. And after PID computation, the DCS system sends frequency command signal to the VFD, to control the VFDs output frequency, so as to control the speed of the air compressor, and realize constant pressure air supply. The frequency command signal sent by the DCS system is 4~20mA current signal, corresponding to 0~100% speed control range. However, as the resistance of the VFD's current signal input terminal is 250Ω. 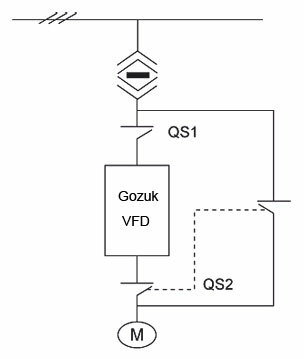 If connecting the three VFDs in series, the total resistance will be 750Ω, which overruns the load capacity of the DCS output signal. So here we need use a 500Ω standard resistance to convert the 4~20mA current signal into 2~10V voltage signal, and connect the standard resistance serially to the three VFDs voltage signal input terminal VG. 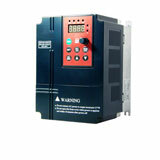 This enables the three VFDs can work synchronously and any VFD can start and stop anytime. 2) Based upon the pressure of the gas container, the DCS system can automatically judge and control the run or stop of the air compressors. 3) The reformed system has realized soft start (why soft start is better), which dramatically reduces starting current, so as to eliminate the impact on the grid and prolong the service life of the devices, saving a lot of maintenance and repair cost. 4) Each air compressor can work with either variable frequency or industrial frequency. On condition that the VFD breaks down, the air compressor will be automatically switched to mains supply. That effectively enhances the system’s reliability. 7) After reform, the air compressors always work at 35~40Hz, with energy saving rate up to 20%~30% (know more about VFD saves energy). a) Please pay attention to the location of the pressure sensor, so as to achieve the highest energy saving efficiency. The pressure sensor and the frequency command should adopt 4~20mA standard signal. The signal cable should be dual-cored shield cable. b) The control system of the VFD should have both open-loop control and closed-loop control for debugging and special condition use. c) Please verify the motor of the air compressor runs forward when a forward run command is enabled, so as not to cause any potential damage to the devices. d) Please do set the lower bound of the VFDs output frequency, so as to ensure enough output pressure, and prevent the air compressor from abnormal vibration. The first plant also has three 160kw aerostatic presses. Commonly, two aerostatic presses can meet the production requirement, so the third one is standby. As the volume of the petroleum gas generated in the refining process always fluctuates, the input pressure PT1 fluctuates as well. 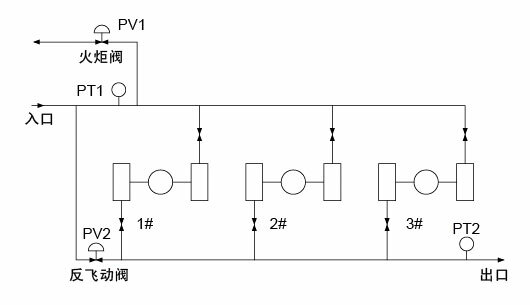 On condition that PT1 is too low (<0.03MPa), the valve PV2 will be open to supplement gas in the portal, which wastes a lot of power. On condition that PT1 is too high (>0.08MPa), the valve PV1 will be open to consume the excessive gas. Massive energy will be also wasted in the process. In contrast, when the VFDs are installed, the system can maintain the input pressure constant through controlling the speed of the aerostatic press. 1. T1, T2 and T3 are air- break switches (same to the original system). 3. 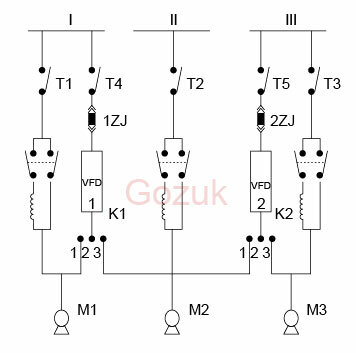 1ZJ and 2ZJ are the newly-added automatic switches of the two VFDs, which can be used on condition that the VFDs break down. When K1 is on position of 1, K2 can be on position of 1, 2, or 3. When K1 is on position of 2, K2 can be on position of 2 or 3. When K2 is on position of 2, K1 can be on position of 1 or 2. When K2 is on position of 3, K1 can be on position of 1, 2, or 3. Thus, on condition of variable frequency, the 1# aerostatic press can work synchronously with either the 2# aerostatic press or the 3# aerostatic press. Or, the 2# aerostatic press works synchronously the 3# aerostatic press, and the 1# aerostatic press is standby. 5. 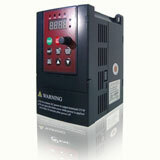 On condition that 1# VFD breaks down, 1ZJ and T4 should be disconnected, and K1 should be on position of 2. The 2# VFD can only drive the 3# aerostatic press, while the1# and 2# aerostatic press can switch to mains supply. 6. On condition that 2# VFD breaks down, the same of Point 5. 7. K1 and K2 should be mechanically interlocked, and meanwhile, can be unlocked for more convenient operation. Closed-loop control of the aerostatic presses is conducted by the DCS system. The DCS system should maintain PT1 within the range of 0.03~0.08MPa and PT2 within the range of 0.9~1.6MPa, so as to realize the highest energy saving efficiency. In addition, the aerostatic presses should work synchronously. After reform, the aerostatic presses always work at 35~40Hz, with energy saving rate up to 20%~30%.